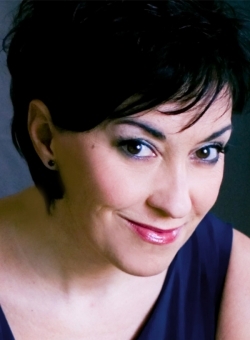 Ria Jones's TV credits include three Royal Variety Performances, The Paul O Grady Show, Wales In The West End, Showstoppers, The Magic Of The Musicals, Sondheim - A Celebration, Bryn Terfel's Faenol Festival and recorded her own TV show for BBC Wales "One Night Only with Ria Jones". For the past six years, Ria has appeared with The Royal Philharmonic Orchestra as a guest soloist at The Royal Albert Hall in The Best of Broadway and has recently recorded "Abbaphonic" the album with the RPO and the Best of Rodgers & Hammerstein, as well as producing her first solo album "Have You Met Miss Jones?". Ria has also recently filmed a cameo role for the BBC award winning sci-fi drama "Torchwood: Miracle Day".